If they grew up in Brisbane, males of my vintage will recognise the Rothwells name - Rothwells Outfitting Limited was the foremost menswear store in Brisbane for many years. 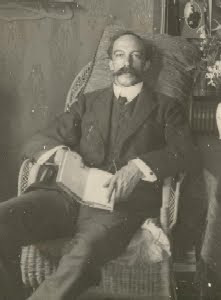 It was formed in 1897 by Thomas Rothwell (below). Thomas Rothwell was born in England and emigrated to Australia where he commenced work as a journalist before becoming an accountant. He was involved in the formation of the RACQ, and he also conceived the construction of Anzac Avenue, a long roadway leading towards Redcliffe that is lined by trees planted in memory of the district's WWI fallen soldiers. That road now passes through the suburb of Rothwell, named in his honour. He became a Companion of the Order of the British Empire in recognition of his charity work for returned servicemen. Although he passed away in 1928 the business continued for another sixty years before coming to an ignominious end. His menswear store was housed in its own building in Edward St near the Adelaide St intersection. The building was erected in 1885, before Rothwells came into being, originally leased to a drapery and importing firm who bought the building in 1896 and then leased it to Rothwells. Rothwells bought the building themselves in 1909, and here is a photograph of it from 1934 showing Rothwells' signage. As well as tailoring and selling menswear, the firm also promoted itself as regalia makers - this means that they manufactured and sold the clothing and accoutrements worn by Masons. Below is a newspaper advertisement for a man's suit, made-to-measure at the price of £4/15/0, or $9.50 as a direct conversion to today's decimal currency. However, that's not the end of the Rothwells story. During the Gordon Gecko-style excesses of the 1980s, Western Australian corporate raider Laurie Connell acquired the company, closed the menswear stores and converted it to a merchant bank. Connell was a Porsche-driving, racecourse-loving entrepreneur (the type my father would call "a spiv") who succeeded in driving the company to the wall in the 1987 stockmarket crash despite a shonky deal with Brian Burke, the disgraced former Premier of Western Australia, that had attempted to shore it up. The resultant Royal Commission cost a further $19 million or so, and found that a director of the company and an auditor from a national accounting firm had conspired to defraud the public by falsifying the company's financial accounts. Connell died during the trial, one of Australia's longest and costliest. We must have shared the same life :) I was studying and working in the late 60s and married in 1970. 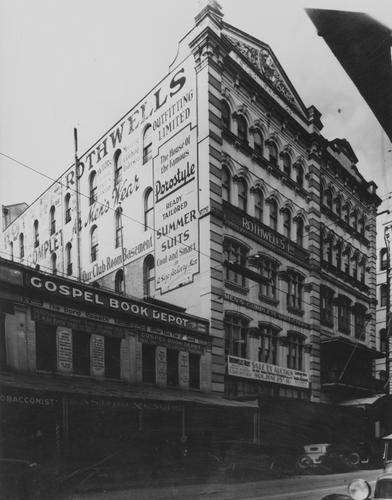 The Rothwells building that was erected in 1885... still looked great in your 1934 photo (although I am not so impressed with the Gospel Book Depot). And even more amazingly, it still looks great in the 2011 photo. So although the 1980s developer-criminals destroyed businesses, incomes and family lives all over Australia etc, Brisbane was a bit fortunate in not losing its loveliest 19th century buildings. WA Inc had a lot to answer for, and we were not untouched in Queensland with the Quintex (Christopher Skase) and Ariadne (Bruce Judge) corporate crime. I once bought a beautiful painting at what seemed like a reasonable price. I paid after the auction and asked the admin staff who had owned the painting beforehand. "Christopher Skase" she whispered, "but you must not tell anyone. He is in hiding in some Mediterranean hidey hole". It's such a shame that Rothwell's was ruined the way it was. If it had survived the 80s as an uppmarket menswear retailer, it would now be in the perfect place, as Edward St is now the CBD's High Street. Will you be following this one up with one about the neighbouring Rowes Building? Nathan: Yes, at some future date we will look at the Rowes Building. Bribie Rob: That's the sort of achievement you don't see any more. He must have had some stories! Bribie Rob, my grandfather W.J.Thomas probably knew your Dad, Jack Price, in the 1920s. We're not sure exactly which years he worked for Rothwells, but after he set up business for himself as a "Ladies' and Gentlemen's Tailor" at 61 Ann Street, he put in his 1932 newspaper advertisements: "Late Head Cutter Rothwells Ltd".